Lessons from Pittsburgh. Brian Jaffee, the Executive Director of The Jewish Foundation of Cincinnati, and I are fortunate to participate in a low-profile, national peer network of about 50 Jewish Federation and Foundation CEOs that calls itself the Tarrytown Group (after the first place they met about 15 years ago). When we met recently, we heard from my friend Jeff Finkelstein, CEO of the Jewish Federation of Pittsburgh. Jeff reflected on the attack on the Tree of Life synagogue, starting with the moment he stood with police as they captured the suspect. Jeff’s insights and lessons confirmed the importance of everything we have done in Cincinnati, one of the first to launch a community-wide security initiative, since 2013. Even though Pittsburgh only launched theirs in 2017, they had already worked with Tree of Life on an emergency response plan. And they had cleared escape routes a couple months before that saved lives on the day of the attack. In the immediate aftermath, the Federation led efforts to help thousands of community members address panic, trauma, and grief. At the same time, they had to increase security and ensure the safety and business continuity of the other synagogues and agencies. Simultaneously, they had to respond to an international media onslaught and endless good will efforts from everyone from the President of the United States to the top echelon of the Israeli government, to Pittsburgh’s elected officials as well as faith and civic leaders, while attending eleven funerals in five days. Jeff said the most essential asset in the 20-hour days following the attack was the corps of long-tenured, Jewish community professionals, whose trust and collaboration enabled them to jump in and lead together, without ego or turf, and make difficult decisions fast. Founding SAFE Cincinnati Director Returns. I am proud that Cincinnati was one of the first Jewish communities to launch a community-wide safety and security initiative. And I am very happy to announce that Mark Dowd, the founding Director of Community Security for SAFE Cincinnati, has returned to that role as Ken Wall stepped down to attend to out-of-town family members. Ken and Mark had served together as colleagues at the FBI for decades. This made it seamless for Ken to take the leadership role during Mark’s two-year absence and to build on the foundation Mark created. Ken has volunteered to remain involved by joining the SAFE Cincinnati Advisory Committee. He established close relationships between Jewish community organizations and local law enforcement and intelligence agencies. And he partnered with them to provide emergency and active shooter training to community agencies. He successfully completed a $1.2 million program, funded by The Jewish Foundation of Cincinnati, to upgrade the physical security of more than 40 Jewish-related institutions in the Cincinnati area. He partnered with the Ohio and Hamilton County EMAs to ensure all Cincinnati area Jewish organizations developed and maintained emergency response plans. Mark could not have taken the safety and security of our community more seriously or more personally. He gained a deep understanding of our community’s traditions and organizations, and he did everything humanly possible to ensure the highest degree of security, training, and emergency preparedness. New Holocaust and Humanity Center Opening. The time has finally come for the opening of the new Nancy & David Wolf Holocaust & Humanity Center at the Cincinnati Museum Center. The new, state-of-the-art facility, inside the city’s largest cultural institution, will bring the lessons of the Holocaust to a much broader audience. Sarah Weiss, Executive Director, brought towering vision and knowledge to this unique center. 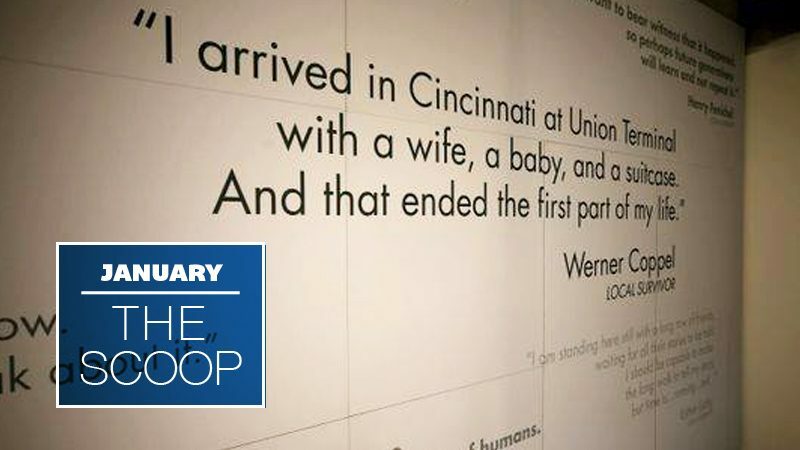 She was especially inspired because many of the Holocaust survivors who settled in Cincinnati arrived by train at this very same site—Union Terminal. I couldn’t be more proud that the Federation led HHC’s capital campaign, which beat its goals and raised more than $15 million for the new center, including a sustaining endowment. This is the first capital campaign of this size that we have run since building the JCC campus a decade ago. We offered our expertise for far less than outside capital campaign consultants, ensuring every dollar possible could go towards creating a top-notch Holocaust center in Cincinnati. Danielle Minson and her team masterfully led HCC through fundraising strategy and timing. This was an inspired partnership with the incredible dedication of the campaign’s chairs, Arna and Bobby Fisher, and co-chairs Bret and Alison Caller, Sandy Kaltman and John Isidor, George and Kim Vincent, and Tom and Mary Ellen Cody. All were moved by incredible generosity, starting with the breathtaking $5 million lead gift from Nancy & David Wolf. The opening of the museum is surely a fitting testament to our community’s dedication to ensuring the lessons of the Holocaust inspire action today. Thank you for caring about our community and what we do.